Limited time only. These spring weeds are far more delicious than their name suggests! If Runaway Apricot isn’t the only food blog you follow, I’m sure you are knee-deep in the frenzy over ramps right now. These delicate greens inspire praise for being among the first vibrant color you can find after months of dull winter produce and their taste is the freshness of spring. But only spring, as their season is as short-lived as it is anticipated. Here’s how to preserve ramps for a little while longer. Still wondering: so what is a ramp? Another member of the allium genus, ramps have a thin but dense bulb like a scallion with dainty broad green leaves. Also known as a wild leek, thanks to an etymology by Bon Appetit, I learned that the gawky name is the product of many attempts to ease the pronunciation of the Old English word hramsa, but the ramps we eat here are of a slightly different variety native to North America. If the name sounds more like an ADA modification than a delicious crop, that could also be because some people still consider the early sprouter to be a weed and garden nuisance. Preserve ramps for weeks in the fridge or freezer. Compound butter is definitely the way to preserve for its versatility and ability to keep in the fridge or freezer for weeks. Recipes for ramp butter are split between all-raw butters and instructions, like mine, which encourage you to simmer the white and light green parts first. After doing a quick taste test of the minced whites, I switched to the latter method to reduce the pungency of the flavor as I didn’t want it to overwhelm my buttermilk cornbread. The fully raw method would pair well with chicken or steak. So get to the farmers market and see all of the green that’s in season!! Straight from the farmers market, these little beauties clean up nicely. You can make the compound butter with all raw additions, but simmering the pungent white part is great for pairing with subtle flavors. No rolling needed or this chiffonade. Swiftly cut the tender greens crosswise to make pretty ribbons. Use a mixer or cream the better with a spoon. This softening ensures that the ramps are evenly incorporated. Wash ramps and remove roots. Mince white and pale green end. Heat 2 tablespoons of butter in a small pan over medium heat and cook ramp whites until just softened, about two minutes. In a mixer with the paddles attachment, or using a spoon, stir to cream the remaining softened butter. Cut green ramp tops crosswise into thin ribbons. Stir ribbons and cooked ramp whites into butter until evenly incorporated. Season to taste with salt and pepper. Pack into a jar or roll in wax or parchment paper. Return to the refrigerator or freezer to firm and store. Now do you see why everyone is going crazy over these? You’ll want to return the creamy, softened butter to the fridge to harden a bit before serving. Also try this with fresh herbs. That cute little jar of butter was completely eaten by my friends at Easter. So glad I kept the extra roll hidden away in the fridge. My BFF Noelle snapped this pic for Instagram. 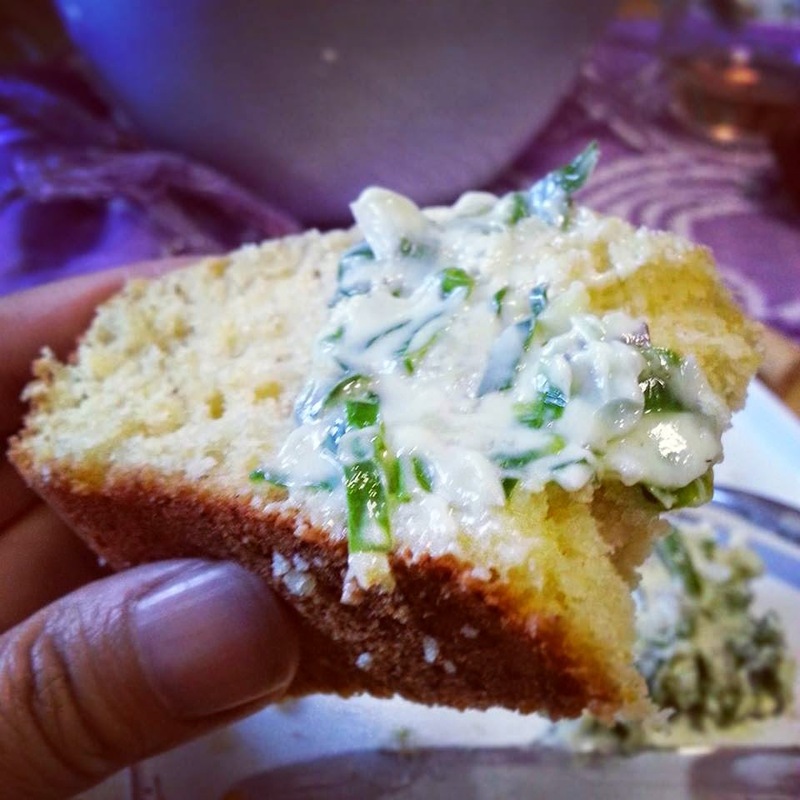 Cornbread and Ramp Butter. It doesn’t get more simple or delicious than this.